An attempt by the police to rescue the kidnapped students of the Lagos State Model College Igbonla Epe ended in serious disaster. A bold effort to rescue the school children abducted last week from Lagos State Model College Igbonla Epe, turned bloody when nine of the policemen sent on the mission were shot and over 20 militants killed during a gun battle on the Ode Omi waterways in Ogun State, according to Sunday Sun. The policemen were attached to the Marine Police section. The kidnappers it was gathered are now demanding N400 million ransom before they would release them. Three of the policemen were said to be still unconscious as at yesterday evening following the gunshot injuries they suffered during the combat last Friday. The nine were still undergoing medical treatment at the police hospital in Ikoyi, Lagos. 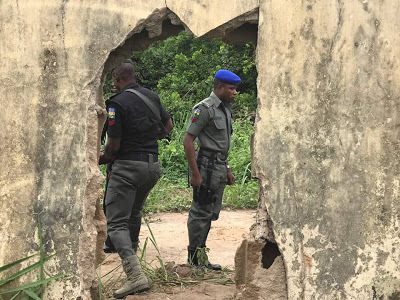 A police source, who spoke on the condition of anonymity said, “Policemen from the Marine Police and others were on the trail of the kidnappers, when the gun battle ensued. It was also gathered that the militants, who were over 50, engaged the policemen in a serious fight which lasted over six hours. The source further said that over 20 militants were killed. It was gathered that the abductors have opened negotiations with the parents of the abducted students. A parent, who pleaded anonymity, confirmed that the abductors had finally contacted the parents of te abducted students. Another police source said the police would liaise with the Navy, to carry out a mop up exercise in the area. Reacting to the incident, a security expert, Dr. Ona Ekhomu, said a situation where the country frequently loses its security operatives to criminal elements was not acceptable. “We need to step up our security to combat militancy because militancy is not going to go away anytime soon particularly in that area. This is because it is profitable for those people who are doing what they are doing right now. We need to increase our special weapons and tactics and we need to increase our swamp visibility so that we can put an end to this violence because a situation where we continue to lose our policemen to these militants is not acceptable; it is totally not acceptable,” he said. Also speaking on the development, Executive Director, Civil Liberties Organisation, Ibuchukwu Ezike who described the development as tragic said the incident was an indication that the security situation in the country was getting more worrisome. He blamed the insecurity in the country on social dislocation and called on the government to equip the nation’s security outfits with modern crime fighting technologies. “Even those who have resisted attempts to indulge in criminal activities are now giving in to it because of social dislocation. Government should work hard to provide employment for the people. “Government should also equip our security operatives with modern security technology as a way of fighting crimes and reducing avoidable deaths among our security operatives because we have lost a lot of our security personnel to these hoodlums. We have had a lot of orphans and widows arising from this saddening situation. This must stop,” he said. A United Nations Ambassador for Peace, Akintunde Alao said the incident underscored the inadequacy of modern crime fighting gadgets. He called on the government to work towards reversing the trend by ensuring that the nation’s security operatives are equipped with up-to-date security gadgests. “Government must as a matter of urgency put in place mechanism to put an end to unfortunate and avoidable deaths among our security officers." They should be adequately equipped with modern gadgets which make it easier for the identities perpetrators of criminal activities to be known quickly without endangering the lives of our security operatives. It is quite unfortunate our security men are exposed and endangered to such level.